그리스 시라쿠사 거리에는 동상이 하나 서있습니다. 각지에서 온 관광객들은 이 동상을 보고 처음에는 모두 웃는답니다. 발에는 날개가 있는 이상한 모습입니다. 그런데, 그 밑에 쓰여진 글을 보고는 많은 감명을 받는다고 합니다. 그 동상 아래는 이런 글귀가 새겨져 있답니다. this article is false partly. a circa 160 C.E, in pentelic marble. Who and whence was the sculptor? Time who subdues all things. Why do you stand on tip-toe? And why you have a pair of wings on your feet? I fly with the wind. And why do you hold a razor in your right hand? As a sign to men that I am sharper than any sharp edge. And why does your hair hang over your face? For him who meets me to take me by the forelock. And why, in Heaven's name, is the back of your head bald? though he wishes it sore, take hold of me from behind. Why did the artist fashion you? For your sake, stranger, and he set me up in the porch as a lesson. This representation of the allegoric statue made by Lysippos, is from pentelic marble. This bas-relief of "Kairos" was once at the Palazzo Medici in Florence, but now has been lost. Definition: fine marble used in ancient sculptures: a fine white marble quarried on Mount Pentelicus near Athens and used for most important Athenian buildings and sculptures during the 4th and 5th centuries B.C. Named from its source on the mountains bordering the Attic plain in Greece. Eminently suitable for fine buildings both in ancient and modern times. All the finer Athenian buildings of Pericles are made of Pentelic marble, the particles of iron in it giving the famous golden tinge of colour. This article is about the word "kairos". For the Christian retreat, see Kairos (retreat). For the Greek personification of opportunity, see Caerus. For other uses, see Kairos (disambiguation). Kairos (καιρός) is an ancient Greek word meaning the right or opportune moment (the supreme moment). The ancient Greeks had two words for time, chronos and kairos. While the former refers to chronological or sequential time, the latter signifies a time in between, a moment of undetermined period of time in which something special happens. What the special something is depends on who is using the word. While chronos is quantitative, kairos has a qualitative nature. Kairos was central to the Sophists, who stressed the rhetor's ability to adapt to and take advantage of changing, contingent circumstances. In Panathenaicus, Isocrates writes that educated people are those “who manage well the circumstances which they encounter day by day, and who possess a judgment which is accurate in meeting occasions as they arise and rarely misses the expedient course of action". Kairos is also very important in Aristotle's scheme of rhetoric. Kairos is, for Aristotle, the time and space context in which the proof will be delivered. Kairos stands alongside other contextual elements of rhetoric: The Audience, which is the psychological and emotional makeup of those who will receive the proof; and To Prepon, which is the style with which the orator clothes their proof. Καιρος - kairos (pronounced keros) means weather in both ancient and modern Greek. In plural it is καιροι -kairoi (keri) and it means "the times". An example of rhetorical kairos appears in Jack London’s “To Build a Fire.” London sets the stage by describing the perils and the enormity of nature compared to man through intense imagery and repetition. He builds up the intensity and power of nature in order to achieve a moment of rhetorical kairos. Once the audience realizes the danger of nature he chooses that moment to show how oblivious the man in the story is. “But all this – the mysterious, far-reaching hair-line trail, the absence of sun from the sky, the tremendous cold, and the strangeness and weirdness of it all – made no impression on the man.” In essence, London asserts his opinion by using rhetorical kairos (London 64-65). The term "kairos" is used in theology to describe the qualitative form of time. In rhetoric kairos is "a passing instant when an opening appears which must be driven through with force if success is to be achieved." In the New Testament kairos means "the appointed time in the purpose of God", the time when God acts (e.g. Mark 1.15, the kairos is fulfilled). It differs from the more usual word for time which is chronos (kronos). In the Eastern Orthodox and Eastern Catholic churches, before the Divine Liturgy begins, the Deacon exclaims to the Priest, "Kairos tou poiesai to Kyrio" ("It is time [kairos] for the Lord to act"); indicating that the time of the Liturgy is an intersection with Eternity. In The Interpretation of History, neo-orthodox Lutheran theologian Paul Tillich made prominent use of the term. For him, the kairoi are those crises in history (see Christian existentialism) which create an opportunity for, and indeed demand, an existential decision by the human subject - the coming of Christ being the prime example (compare Barth's use of geschichte as opposed to historie). In the Kairos Document, an example of liberation theology in South Africa under Apartheid, the term kairos is used to denote "the appointed time", "the crucial time" into which the document or text is spoken. With this meaning, the term is also used a name for religious Kairos retreats. According to ancient Greeks, Kairos was the god of the “fleeting moment,” “a favorable opportunity opposing the fate of man.” Such a moment must be grasped (by the tuft of hair on the personified forehead of the fleeting opportunity); otherwise the moment is gone and can not be re-captured (personified by the back of head being bald). "Who and whence was the sculptor? From Sikyon. And why, in Heaven's name, is the back of your head bald? Because none whom I have once raced by on my winged feet will now, though he wishes it sore, take hold of me from behind. Why did the artist fashion you? For your sake, stranger, and he set me up in the porch as a lesson." This statue was the original model for the various representations of Kairos made in ancient times and Middle Ages as well. John Tzetzes wrote about it, as well as Himerius. The image of hair hanging on the forehead and a bald nucha was associated in Roman times to the goddess Fortuna, the personification of good and bad luck. Several authors referred to this. For instance Disticha Catonis II, 26 refer to the Latin concept of Occasio (a female word which can be considered as a literal translation of the Greek Kairos; see also Caerus) in these terms: "Rem tibi quam scieris aptam dimittere noli: fronte capillata, post haec occasio calva", which means "Don't let that what you consider good for you escapes by; chance has hair over her forehead, but behind she's bald". Phaedrus (V,8) has a similar writing and he himself admits that the theme was not his own but more ancient. Callistratus (Descriptions, 6) has a long text describing the statue by Lysippos. 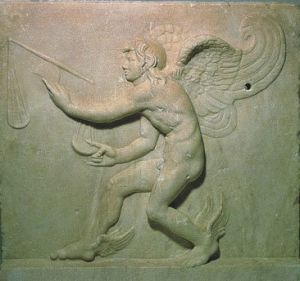 In Trogir (the ancient Roman Tragurium), Croatia, in the Convent of the Benedictine Nuns, was displayed a marble bas-relief of Kairos from the 3rd century B.C., as a young man, running. The bas-relief is now kept at the Municipal Museum of Trogir. The theme of Kairos was felt as extremely important during the Middle Ages. Carmina Burana 16, a famous poem about Fortune, mentions Kairos in this way: "verum est quod legitur, fronte capillata, sed plerumque sequitur occasio calvata"; which means "it is true what is read, that Occasio has the forehead with hair, but that almost always she passes being bald". Several representations of Kairos survive; a relief (about 160 C.E.) is kept at the Museum of Antiquities of Turin (Italy); another relief was kept (now lost) at Palazzo Medici in Florence; an onyx gem (originally from the collection of the Duc de Blacas, I-II century C.E.) with an incision of the god Tempus (see Caerus) with attributes of Kairos is kept now at the British Museum; a marble relief showing Kairos, Bios (the Life), and Metanoia (Afterthought, the female Latin Paenitentia) is in the cathedral of Torcello (XI century C.E. 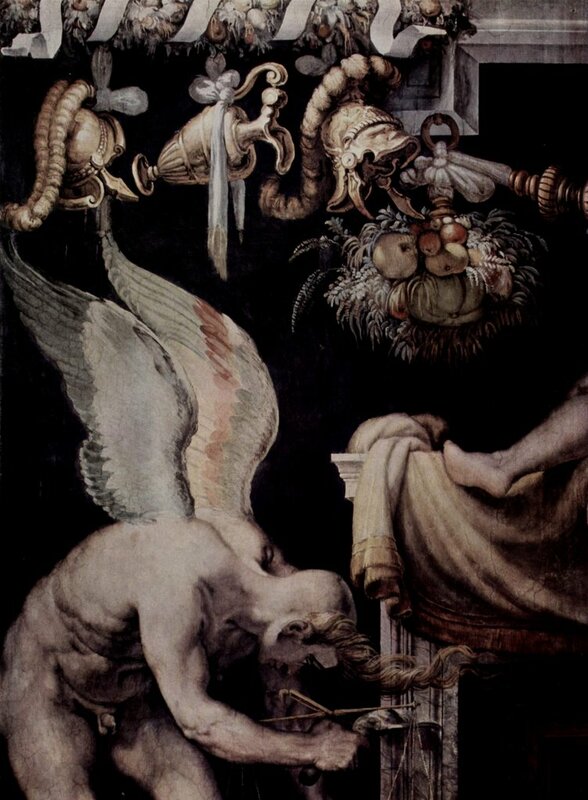 ); a monochrome fresco by Mantegna at Palazzo Ducale in Mantua (about 1510 C.E.) shows a female Kairos (most probably Occasio) with a young man trying to catch her and a woman representing Paenitentia. A concept similar to Kairos is that behind the famous motto "Carpe Diem" and a sort of recurrence in the idea of Kairos is linked with the theme of The Wheel of Fortune which continuously rotates; in fact the Greek words used by Poseidippos to describe the Kairos (in the verse "I am ever running") are "aeì trochào" which literally mean "I always rotate", and the verb itself is the same used by the poet and astronomer Aratus (Phaenomena, 227, 309) to pinpoint the eternal motion of the celestial spheres. It is not by chance that in Carmina Burana 17 the Fortune is associated to an ever-rotating wheel (Tibullus himself described the Fortune with a wheel: "Versatur celeri Fors levis orbe rotae", (I, 5, 70). ^ Mark Freier (2006) "Time Measured by Kairos and Kronos"
Paolo Moreno, L'attimo fuggente in Archeo magazine (XXII, 10, 260), October 2006, pp 114-117. London, Jack. “To Build a Fire.” Lost Face. New York: The Macmillan Company, 1910. 시간에는 두 가지가 있다. 흘러가는 시간도 있고, 의미 있는 시간도 있다. 흘러가는 시간을 헬라어로 '크로노스'(chronos)라 하고, 의미 있는 시간을 '카이로스'(kairos)라 한다. '크로노스'는 연대기적인 시간을 말한다. 그래서 연대기를 말할 때 영어로 '크라너클'(chronicle) 또는 '크러날러지'(chronology)라고 한다. 이는 천문학적으로 해가 뜨고 지면서 결정되는 시간이며, 지구가 공전과 자전을 하면서 결정되는 시간이다. 매일 한 번씩 어김없이 낮과 밤이 찾아오고, 매년 한 번씩 봄여름 가을 겨울이 찾아오는 시간이다. 생물학적으로는 동식물이 낳고 늙고 병들고 죽는 시간이다. 철새들이 철 따라 이동하고, 연어가 태어난 곳으로 되돌아와 알을 낳고 죽어 가는 시간이다. 이 속에서 인간을 포함한 모든 동물들이 웃고 울며, 분내고 기뻐하며, 번민하고 수고하며 살아간다. '카이로스'는 특정한 시간 또는 정한 시간을 말한다. 시간은 비록 흘러가는 것이지만, 시간에 특별한 의미가 있을 때에 이 의미 있는 시간을 '카이로스'라 부른다. 그래서 '카이로스'는 어떤 일이 수행되기 위한 시간 또는 특정한 시간을 가리킨다. 계획이 세워지고 그 계획이 실행되는 시간을 가리킨다. 역사에도 두 가지가 있다. 조사(survey)나 탐구(research)에 의한 순수 역사가 있고, 해석이나 뜻으로 본 풀이역사가 있다. 순수역사를 독일어로 '히스토리에'(Historie)라 하고, 풀이역사를 '게쉬크테'(Geschichte)라 한다. 역사는 시간적으로 보면 과거에 속한다. 흘러간 시간 속에서 발생했던 일들을 한 곳에 모아 적으면 역사가 된다. 개인의 역사를 모아 적으면 전기나 자서전이 되고, 신앙체험을 모아 적으면 간증집이 된다. 간증집은 '게쉬크테'로, 전기는 '히스토리에'로 분류될 수 있다. 그러나 전기라고 해서 반드시 '히스토리에'인 것은 아니다. 일찍이 그리스 사람들은 시간을 ‘크로노스(Chronos)’와 ‘카이로스(Kairos)’로 나누어 구분을 했습니다. 크로노스는 가만히 있어도 흘러가는 자연적인 시간입니다. 즉 달력의 시간, 객관적인 시간입니다. 천문학적으로 해가 뜨고 지면서 결정되는 시간이며, 지구가 자전과 공전을 하면서 결정되는 시간입니다. 낮과 밤을 알려 주며, 봄, 여름, 가을, 겨울을 알려 주는 시간, 우리를 육체적으로 늙게 하고, 죽게 하는 시간입니다. 카이로스는 목적을 가진 사람에게 포착되는 의식적이고 주관적인 시간입니다. 순간의 선택이 평생을 좌우하는 시간입니다. 즉, 기회의 시간이며 결단의 시간입니다. 시간이 어떻게 흘러 가는지 잊어 버릴 정도로 몰두하는 시간입니다. 1분이 1년보다 길 수 있으며, 1년이 1분보다 짧을 수 있는 시간입니다. 응급환자에게 있어서의 1분은 무위도식 하는 사람의 1분과는 비교할 수 없을 정도로 소중합니다. 바로 이 시간이 카이로스 입니다. 우리는 크로노스의 시간은 관리할 수 없습니다. 그러나 카이로스의 시간은 마음먹기에 따라서 얼마든지 늘일 수도 줄일 수 도 있습니다. 왜냐하면, 주관적인 시간이므로, 같은 양의 물리적 시간이라도 사용하는 방법에 따라 두 배 혹은 세 배까지도 늘려서 사용할 수가 있습니다.